The album is the band’s first since 2013’s Afterglow and comes after the announcement their comeback in April last year. BCCIV was recorded over seven days with producer Kevin Shirley, who has worked extensively with Bonamassa. “What I was hoping to feel at the end of seven day was exhausted, but joyous,” says the guitarist. “This is not easy, doing an album in seven day. You’re working hard. You’re tired, and you feel it everywhere. And I feel joyous! 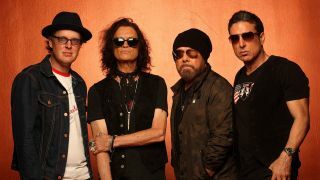 Black Country Communion announced the album’s release at the beginning of the month, and have three UK shows lined up for the new year (dates below). Tickets are on sale now. Since the announcement, the band have released a video for Collide. BCCIV can be pre-ordered now.